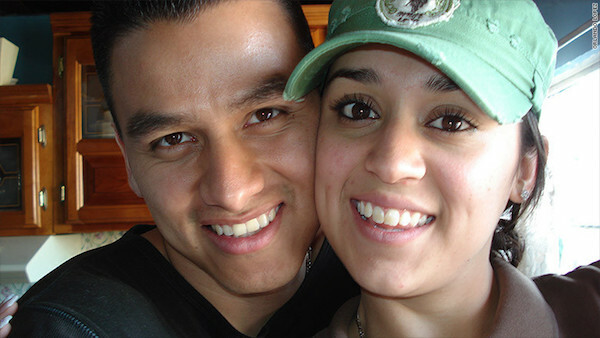 A week ago CNN reported the happy story of a man deported from Texas back to Mexico, who found love in his native country and managed to rebuild his life. His parents took Oscar Lopez to the United States when he was only three years old. Despite being a good student at a high school in Fort Worth, Texas, he was also part of a gang and had to spend seven years behind bars. After obtaining his certificate of studies from prison, he was deported back to Mexico when he served his sentence, being only 24 years old. López says that if he had stayed in the United States, "it would have been a statistic." Now, with 38 years, he lives in Chihuahua Mexico, fell in love and has a daughter. Oscar López and his wife. Source: CNN. As López told CNN, his tool to adapt and get a job was his high level of English: "Lopez said that about 30% of workers in the Chihuahua call center grew up in the United States and were deported or returned to Mexico on their own means. That mix has helped maintain a very American culture in the office, but even so, the new workers feel nostalgia for the United States. " Lopez's experience is not unique. Many of the immigrants who have to return to their country of origin after growing up in the United States face difficulties in adapting to the circumstances - from the pace of life to the idiosyncrasy of their country of birth. Lopez said that returning to Mexico is to find a totally different country, but the options are not so devastating: "Although your cage is golden, it is still a prison," he said about life in the United States. "In Mexico, at least you are free." Returning to Mexico not only brings with it the difficulty of not knowing the place, having few or no contacts at all or fighting against the nostalgia of what was left behind, it also represents an impassable obstacle to not being able to get a job and living with the stigma of "criminal". But not all cases are the same. Roger Pérez, 21, was deported to Mexico. At the time of arriving at the airport, he was greeted by a government official who gave him indications about the unemployment forms he could fill out, but he was also questioned by Diego María, a 36-year-old man whose business card read "We are here to help you. Together we are stronger. " The story, originally published by The LA Times, reports the effort of deportees like María who call themselves "Deportees United in the Fight." The group assists newcomers with phone calls for family members, transportation directions and enrollment in the few benefits provided by the government to help migrants; but, above all, they go to the airport to "make them feel that they are not alone". "Being deported is the most traumatic experience of your life," said Maria to the LA Times speaking from personal experience, having lived in the United States for 17 years before being deported last summer. Deportees United is part of a network of community groups organized for some years to help the Mexicans who have arrived back in the country. According to a report from the Pew Research Center, "this trend of reverse migration has been driven by the loss of jobs after the Great Recession and by the increase in the deportations under the Obama administration." The report also states that during the first four months of this year, "more than 50,000 Mexicans have been deported, according to the Mexican government, a deportation rate similar to that of the last year of Obama's presidency." While the Mexican government used to ignore returning migrants, the rhetoric of the new administration at the White House has prompted a number of measures by Mexican political leaders such as press conferences at airports to receive deportees and integration programs. But this has not been enough. While the deportees receive "six months of aid, which includes $ 100 per month," the measures have failed to tackle the problem at source. Deportees United organizes temporary residency centers and has recently opened a digital printing center that only hires Mexican deportees, in a gesture that tries to dismantle the stigma of "criminal" that weighs on the citizens. In this way, the new "foreigners in their own land" manage to be in a small community that understands their "strange" tastes and their new traditions, trying to transform a terrible experience into a new opportunity.